With the newer version of the International Energy Conservation Code (IECC) coming to states throughout the country, builders may have to make swift changes in practices to meet new, more stringent home energy efficiency requirements. For example, the state of Pennsylvania recently updated from the 2009 IECC to the 2015 version, which improves the energy efficiency of a home by 25 percent. The code also comes with a new air tightness requirement of 5 ACH50, which now needs to be verified by a blower door test. That’s proven to be an obstacle for some builders, particularly in states where testing was not previously required. Contractors know that energy efficiency starts with framing, but what specific framing practices can help increase home energy efficiency? Norbord’s Doug McNeill talks about how builders can implement small changes in framing to get big changes in home energy efficiency — without substantially increasing costs. (shown at right: tall wall construction). McNeill said framing’s role in achieving an airtight construction is well understood, but in states where there hasn’t been a significant building energy efficiency code update in years, there’s less motivation for builders and framers to change framing practices. Eventually, more states will adopt stricter building codes that require tighter homes. 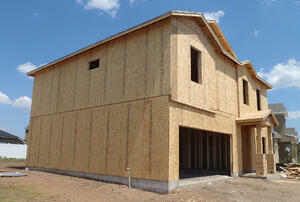 McNeill said builders and framers can modify standard framing by using longer sheathing and raised heel trusses. These changes can deliver more energy-efficient homes. Once the wall panels are installed, McNeill said it’s incumbent on the trades that follow the framers – electricians and plumbers – to ensure that no unintended holes are created in the frame. “Many builders have no one who goes back to check for holes, and this can cause a major issue when it’s time for blower door testing,” he said. He noted that one builder’s approach to mastering the air tightness is to conduct two blower door tests --- one at the end of the framing stage and then another when the house is ready for final sealing. The first reveals if there are persistent framing imperfections issues to be resolved before other trades are called in. 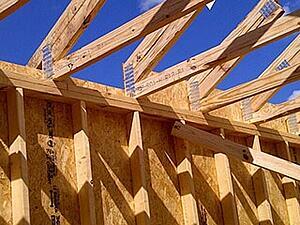 McNeill also points to the advantages of raised heel trusses (pictured at right) for builders. This energy-efficient building practice differs from conventional trusses in that the height of the truss is raises the top chord of the truss where it meets the top plate of the wall. This type of truss allows two big advantages: it simplifies attic ventilation and leaves more room for additional insulation that can extend above the exterior top wall plates. 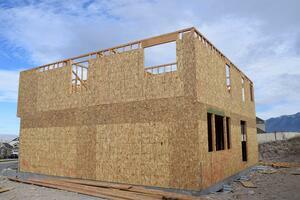 McNeill said there are other advantages to employing taller panels and raised heel trusses. The panels lend towards better curb appeal for potential buyers. “Using longer panels looks better and is worth more,” he said. Also, the home’s energy efficiency is a compelling benefit to potential buyers – who may know that energy-efficient homes are less expensive to operate and typically sell for more and in less time. McNeill urges builders to inform consumers of the distinct advantages of their company’s construction practices and use them as a selling tool with potential buyers.